Not sure where else to post this, as I couldn't find a CIBC building thread. From the sounds of it, this building is bleeding tenants to newer projects. Why not convert this into a residential condo or rental building? As I mentioned in another thread Im quite sure Colliers is moving out of the CIBC to 1515 Douglas! They must be one of it not the oldest tenant in that building other than CIBC. I dunno, I can't remember a time when Jones Emery wasn't at 1175. If you look at CBRE's posting there is quite a lot of vacant space within the building. Over 38,000 square feet vacant in total. Several short office towers from that era have been converted to condos/rentals in other cities across Canada. Something tells me the CIBC Tower is nearing the end of its life as an office building unless it undergoes major restoration work and upgrades. 40k of empty space is no laughing matter and at least one major tenant is shaping up to relocate within 2-3 years. The Rohani (Staples Tower) is not faring much better but at least it's a much smaller building and easier to lease to more tenants. Here's one in Edmonton. Not quite as old as the CIBC but pretty close. It was being renovated into lofts when I worked across the street back in the early 2000's. This is pretty cool too. A bunch of office building conversions in close proximity in Cleveland. Be sure to read the accompanying article describing the boom in conversions across the united states as residential vacancy rates stay low and commercial vacancy stays high. Edited by Mr Cook Street, 18 November 2014 - 04:32 PM. Yeah it's neat, hey? If the CIBC were converted into lofts they'd be pretty popular. I just can't see the tower attracting tenants with moderns digs available. You're literally paying the same price to be in a 50 year old building as you are in a brand new tower. 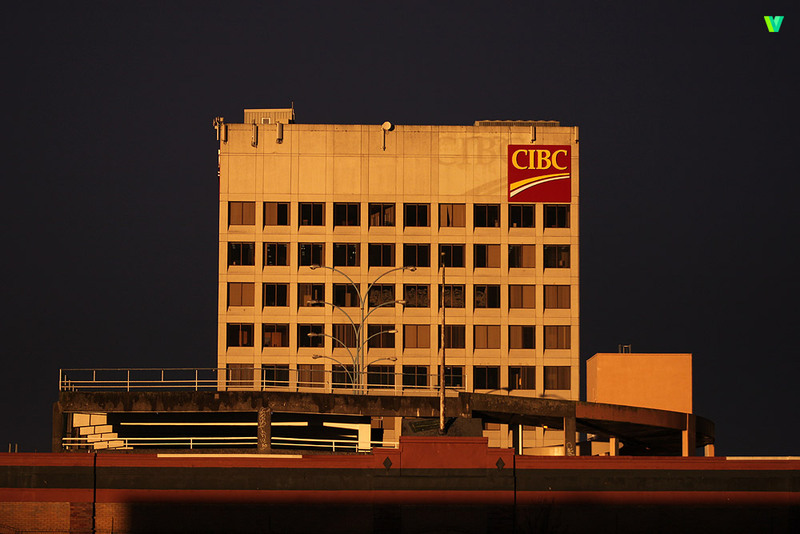 Do we even know who owns the CIBC building? Keep in mind Midtown Court has over 38K of office space currently for lease. I hope there will always be a good supply of moderately-priced office space (class B I think it's called) for tenants that can't quite afford the top end. Vancouver's Westcoast Transmission Building (now "The Qube") is a similar office to residential conversion without balconies. Edited by Rob Randall, 19 November 2014 - 07:20 AM. Yes that's right and Midtown doesn't have a great location going for it. The issue with the CIBC is it's quite expensive. Even though it's a class B it's not affordable for a lot of startups and the like. It could be part upkeep of an old building and part premium for the location but tenants are definitely looking elsewhere. I think it's probably the most prestigious of the Class B's. I know you had a struggle finding decent Class C. I know even that old Trounce Alley tower is expensive. ....Vancouver's Westcoast Transmission Building (now "The Qube") is a similar office to residential conversion without balconies. This style of cantilevered design had a pretty short lifespan - didn't it? I think the other most famous one is the Ranier Tower in Seattle. I guess once you've done those two designs there's not much else left to do and by that time Jane Jacobs' take back the storefront movement had taken hold so the tower on the pedestal died out quckly. Edited by Rob Randall, 19 November 2014 - 09:17 AM. This city really lacks quality yet reasonably priced office space, that's for sure. The CIBC in any other city would be more like a B- and not the B++ it is here, which goes to show how little interest investors have in this market (the government will take a bunker if they need to). Meanwhile lease rates are through the roof for stock that doesn't warrant it. @Concorde, its overly expensive for what it is, that's the problem. The owners are banking on location as their only upside. Once 1515 Douglas is ready expect tenants to flock there from the aging digs of our class b buildings.